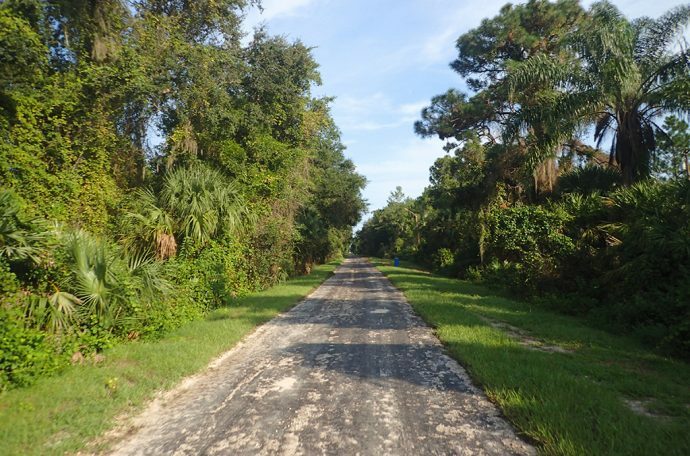 C2C North Titusville | Florida Hikes! Steve, my oldest biking buddy, invited me to join him and a few of his fellow riders to ride the Coast-to-Coast Trail in North Titusville. It has been under construction for several years. He said the “Road Closed” signs were finally down along the trail paralleling US 1 north of Dairy Road, and they were going to have a look. Since last year, the pavement has been in place. I patiently waited for the closed signs to go away. It’s been a long wait. I watched the paving trucks finish up and the sod put in place on the sides of the trail. One day I noticed the bike path signs – stop, yield, and such for bikers – were up. The bike path pavement was marked. But those “Road Closed” signs never came down. 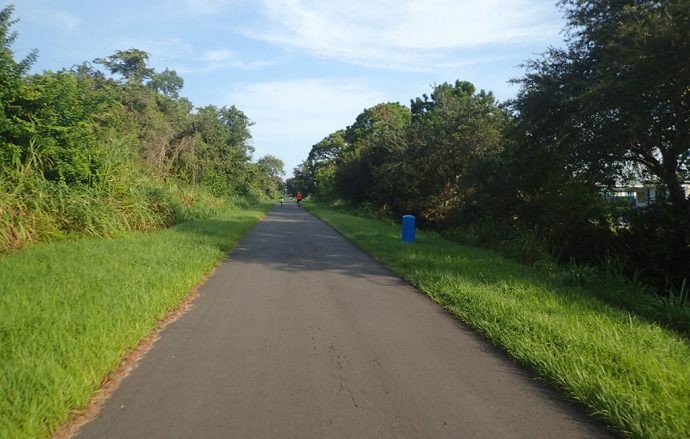 Each time I drove by the trail, I saw cyclists and walkers using it. Looking closer, I noticed that the “Road Closed” signs were still there. They were laying face down in the grass or on the pavement. For months I have watched this happening, and decided to wait a little longer before I “offically” rode it. The trail had to be opening soon, didn’t it? Without a word, the signs vanished in early September. On Labor Day, I was there bright and early to join my friends for an exploration of the new bike path. The signs were gone, but not far north of the crossover to Chain of Lakes Park there was a missing piece of pavement. We easily rode across. We were an eclectic crew, riding on an antique mountain bike, a long wheelbase recumbent, a skinny tire short wheelbase recumbent, and me on my Trek mountain bike. After that rough patch it was smooth riding along the paved old railroad grade. Heading up to and through Mims, we came to SR 46. This is the only real highway crossing. To our surprise a kind motorist stopped and waved us across. Along this section of the trail is beside what had once been US 1. North of SR 46, we cycled into Old Florida. 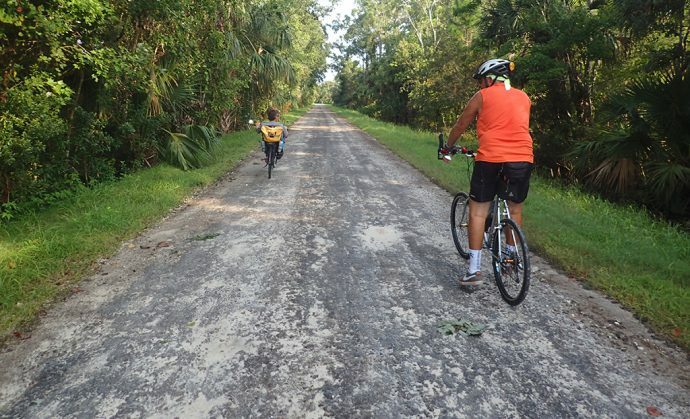 The road that parallels the trail was the original US 1. This would have been the road my parents used in 1957 as my father was heading for his new job at Cape Canaveral to work on the early space program. If you look closely there are a couple of very old houses and and an old citrus processing plant along the way. As the road turned west, the bike path continued straight as an arrow into a nicely treed corridor. Behind the taller vegetation I could see people playing golf on the Walkabout golf course. North of there we came to an odd turn around, looking a lot like a traffic circle. Further north the pavement abruptly came to an end. Not seeing any “Road Closed” signs, two of us continued along the bumpy partially graded limerock surface up to Burkholm Road. The crossing was just up around a slight bend. 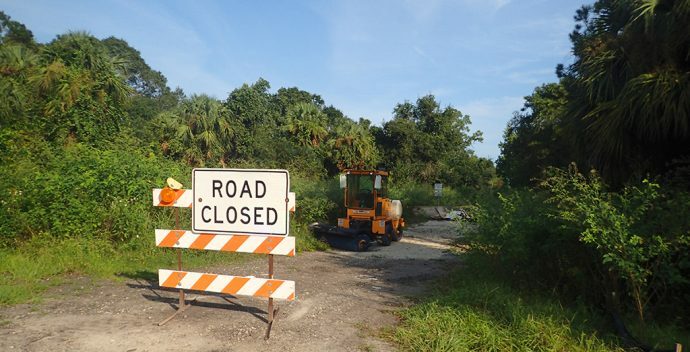 On the north side of Burkholm Road, heavy equipment blocked the path. Beyond the large “Road Closed” and “No Trespassing” signs, we could see the concrete overpass of Interstate 95 as it goes over Aurantia Road. North of there, the bike path begins its western turn towards Maytown, and the eventual connection with the East Central Regional Rail Trail to Osteen and Enterprise, and the Spring to Spring Trail to Lake Monroe. And one day, all the way across the state. After the ride, I drove up to Aurantia Road to take a look at where the bike path passes under I-95. North of that underpass, I could see the unpaved trail starting its western and the beginnings of a trailhead parking lot under construction. Other than a couple old homes in what once was Maytown, there isn’t much else along that route as the old railroad bed goes across old timber farms and swamps. It will be interesting to see what the trail reveals about the region’s past. I can’t wait to ride this next section in the future. Coming from south Brevard and not too familiar with the Titusville/mims area…. 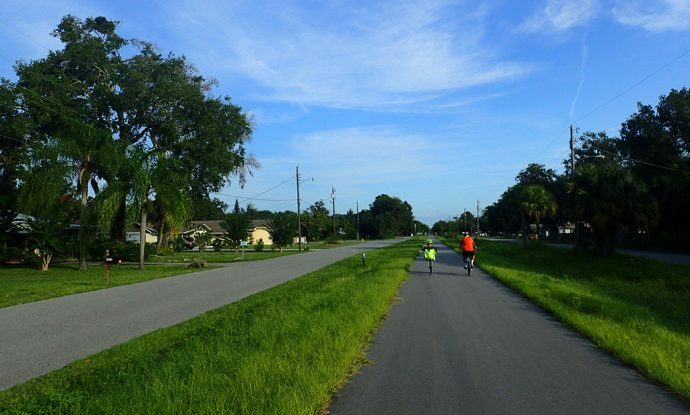 It would be helpful to know where this is in Titusville and the length of the ride that you took. My wife and I are avid trail riders and have been looking for info on the c2c. Trail. Any detailed info or places to find that info would be appreciated. We’ve been waiting for further expansion to put the Titusville-Mims section into our online database (vs. these articles about John’s rides). As of this last trip he did now there are no official trailheads in Titusville or Mims proper. 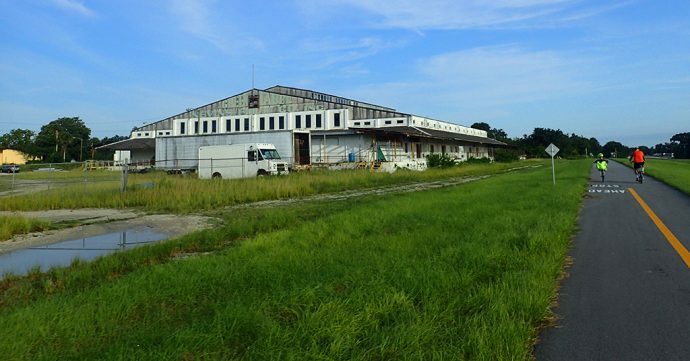 We saw one being built under I-95 off Aurantia Rd, but it was in a construction zone. We’ve parked at Draa Rd (wasn’t an official trailhead) to bike north and south. You can park at Chain of Lakes but must ride out on its entrance road and cross US 1 to access the trail. I’ll talk to him about checking on where best to park and what the length of this ride was … he did not carry a GPS on this trip. It was a surprise to me to find it open so I rode it without my GPS! Will do so and make a map next month. We haven’t found any good maps online yet. Sorry to hear about Brevard Outdoor Adventures. Thanks for the update.